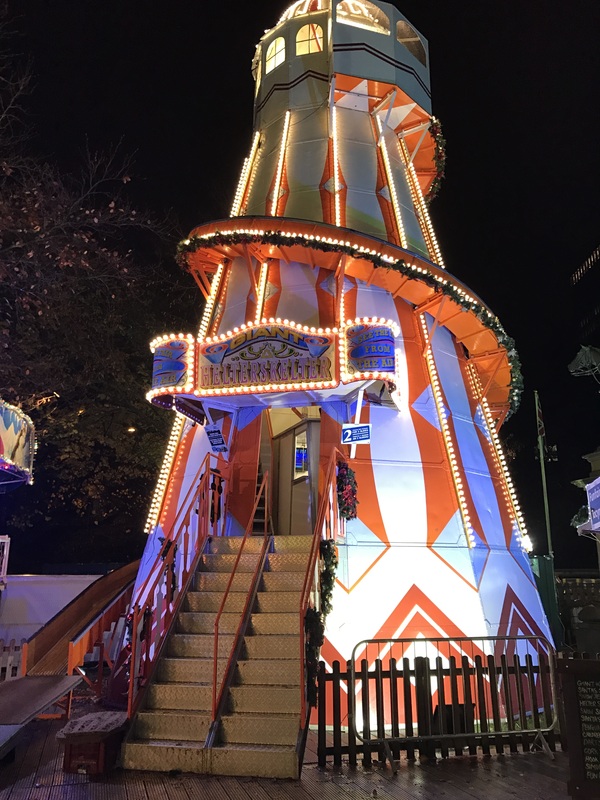 A trip to Cardiff’s Winter Wonderland has become one of our pre-Christmas traditions since having children. In fact, my children think the famous song is written about this place. 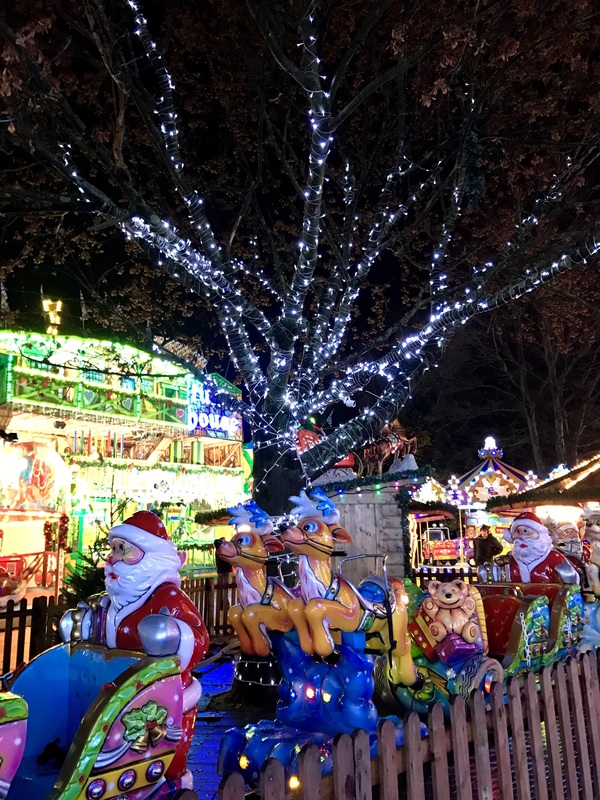 We usually try to fit in at least one visit in the run-up to Christmas, so our children can go on a couple of rides and we can soak up the festive atmosphere. I love all the sparkling lights and Christmas music. 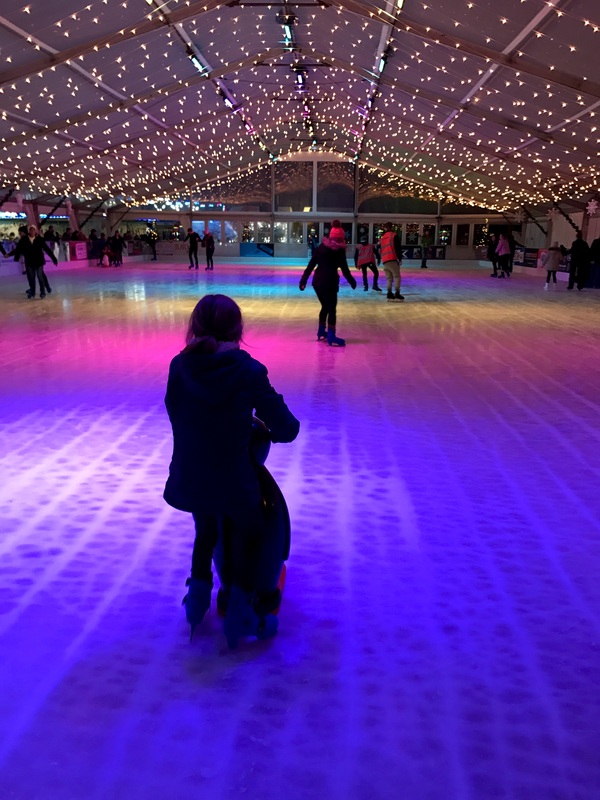 We were lucky enough to be invited along last night for an hour-long family skate on the Admiral ice rink (see below for details of how to win one yourself!) and a few rides. After two days of solid rain, we were so grateful that for the first time, the ice rink has a roof, meaning you can skate whatever the weather. And not just any old roof – the roof looked absolutely gorgeous, decorated with lights and with views of City Hall and the evening sky. My children have never been ice skating before, and as Toddler is too young (children need to be three and over), he stayed on the sidelines with Cardiff Daddy while I took Little Miss E, almost 7, and Little Man O, 5, onto the ice by myself. After swapping our shoes for skates, and collecting penguins to help my children steady themselves on the ice (younger children can hire them for £5), we were ready to go. Despite the fact I’ve not been ice-skating for at least 15 years, I was pleased to discover it was just like riding a bicycle and I’d not forgotten at all. I was desperate to whizz off around the ice, but I had two little people to help. 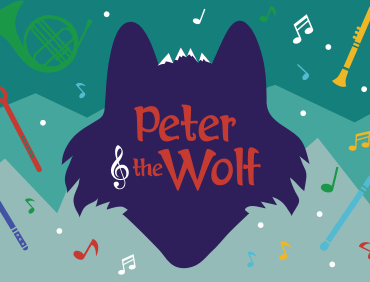 It took them a while to get the hang of it – both were reminiscent of Bambi on the ice, with their legs sliding apart and a few tumbles here and there. 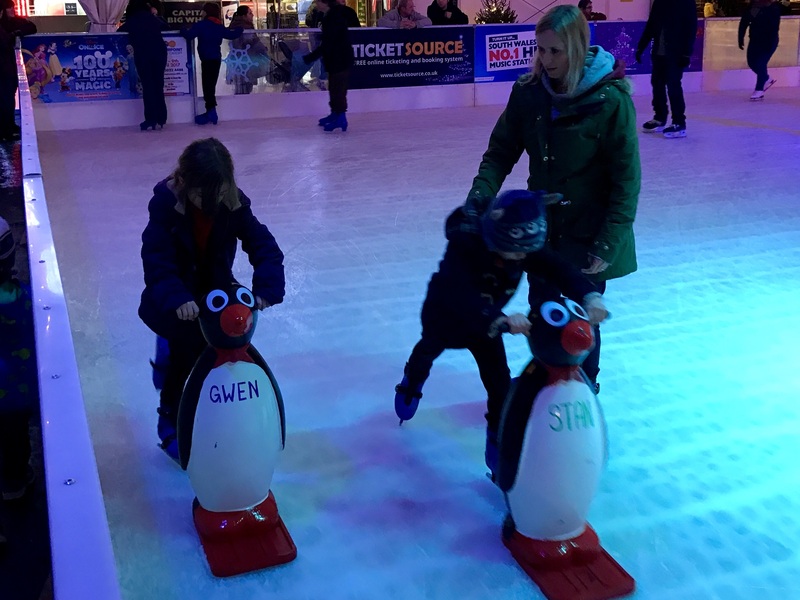 However, after a quick lesson from me on gliding with their feet, rather than walking on the ice, they got the hang of it and managed a few (admittedly slow) laps of the rink without stopping or falling. 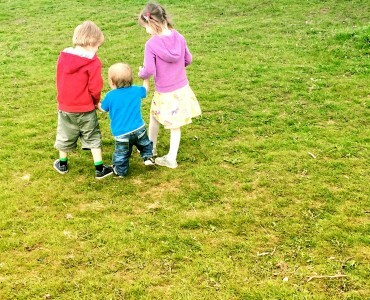 As our hour came to the end, I passed the kids over to Cardiff Daddy and managed to have a skate around on my own. 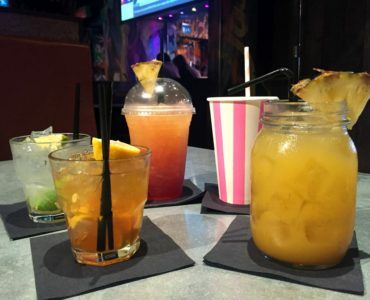 I’d forgotten how much I enjoyed ice skating with my friends as a teenager (anyone else remember Friday night disco ice skating at the old Cardiff ice rink?!). It made me think I need to plan a child-free skating trip to truly make the most of it. From there, we headed on to the rides. As is always the case when you go to a fun fair with children, the grown-up rides are relegated in favour of waving enthusiastically as your kids go round and round on brightly-coloured trains and carriages. My children loved the reindeer sleigh ride and the merry go round, where they had a choice of vehicles to sit in. They also went on the Fun House with Cardiff Daddy, three floors of wonky floors, crazy steps and stepping stones across water. 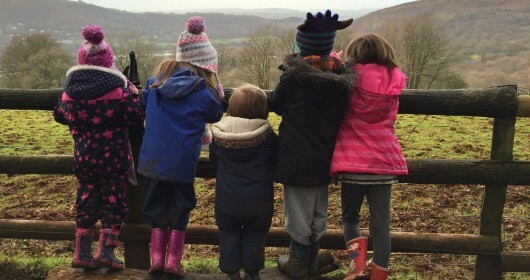 We were lucky to have been there to review, because usually my children only get to go on one or two rides. As much as I love Winter Wonderland, the costs soon add up, especially if you want to buy food and drink in the Alpine Village too. Most of the children’s rides cost between £1 and £2, with the adult ones around £3. The big wheel costs £5 a person – we didn’t go on it, but it did look amazing. We visited on a Tuesday night after school. 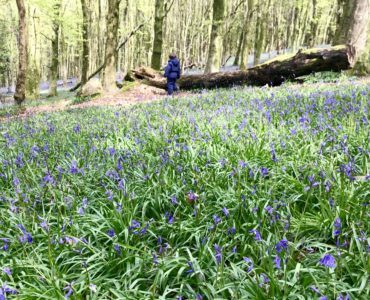 Although it was perhaps not as atmospheric as when it’s busier, it was so much calmer than when we have previously been at the weekend. The lights were sparkling, the Christmas tunes were playing and we came away feeling very festive indeed. Winter Wonderland and the Admiral Ice Rink are open until Tuesday 3rd January. 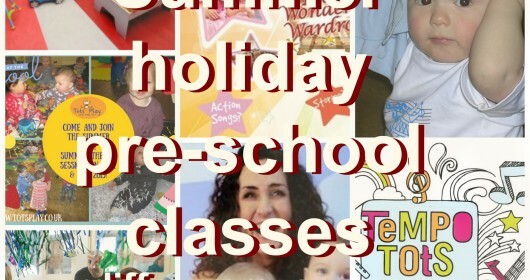 Visit the website for more information. Win a family ice skate! 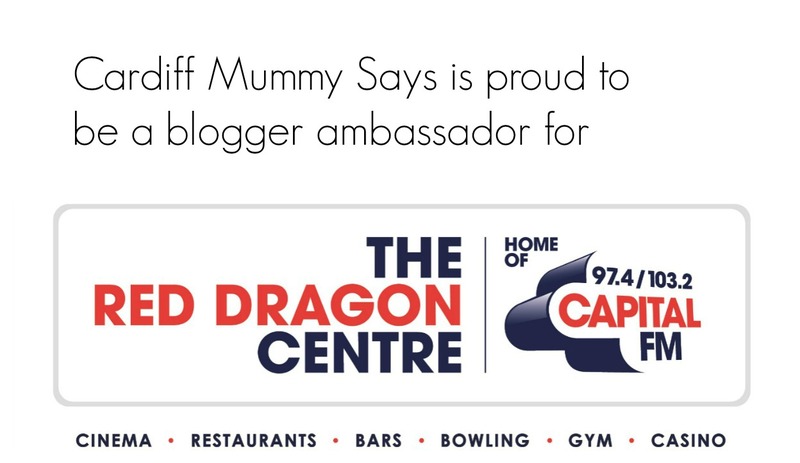 One Cardiff Mummy Says reader will win a family skate at the Admiral Ice Rink at Cardiff’s Winter Wonderland in this great giveaway! The prize includes four tickets and can be used at any public skating session subject to availability, apart from New Year’s Eve. 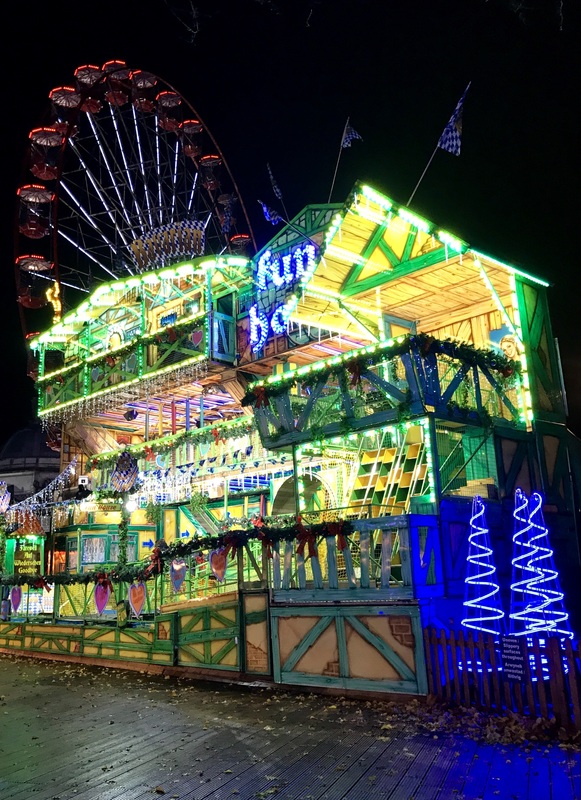 For your chance to win, just answer this question in the comments section below the Winter Wonderland post on the Cardiff Mummy Says Facebook page. What were the names of the penguins my children used to help them skate? Closing date for entries is Friday 25th November 2016, 11pm. The winner will be chosen at random from all entries with the correct answer, submitted before the closing date. There is no cash alternative prize and tickets are not transferable. 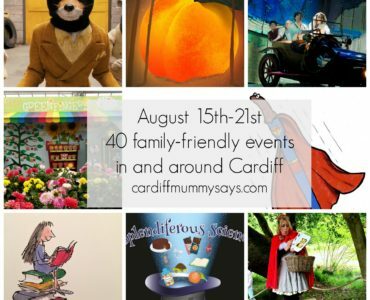 For more ideas of family-friendly days out and events in and around Cardiff, follow Cardiff Mummy Says on Facebook, Twitter or Instagram. 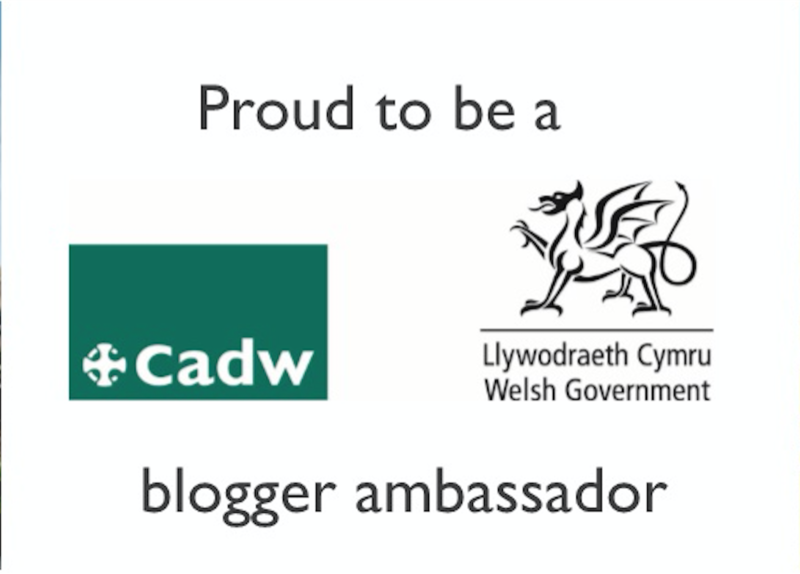 Homepage » Cardiff » Ice skating at Cardiff’s Winter Wonderland – plus win a family skate! 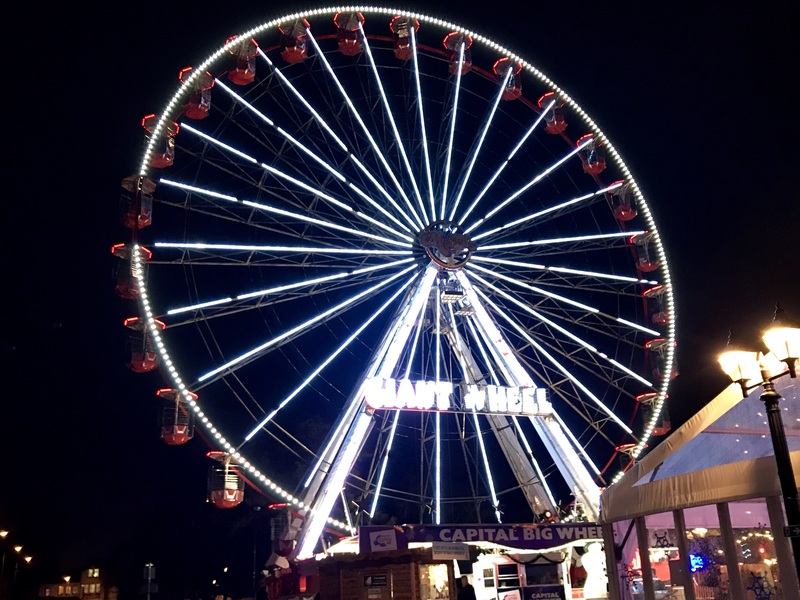 11 Comments to Ice skating at Cardiff’s Winter Wonderland – plus win a family skate! ThEmma penguins are Gwent and Stan. Hoping to take my 2 for the first time this year. Gwen and Stan! Can’t wait to visit the winter wonderland for the first time in years with my family. The joys of moving back home to cardiff. 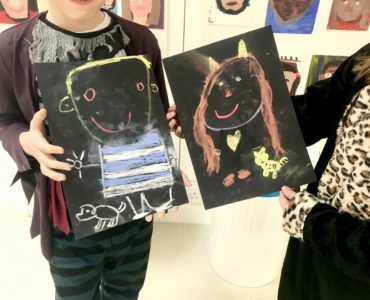 Gwen and Stan-looks amazing, would love to take the children for their first visit! 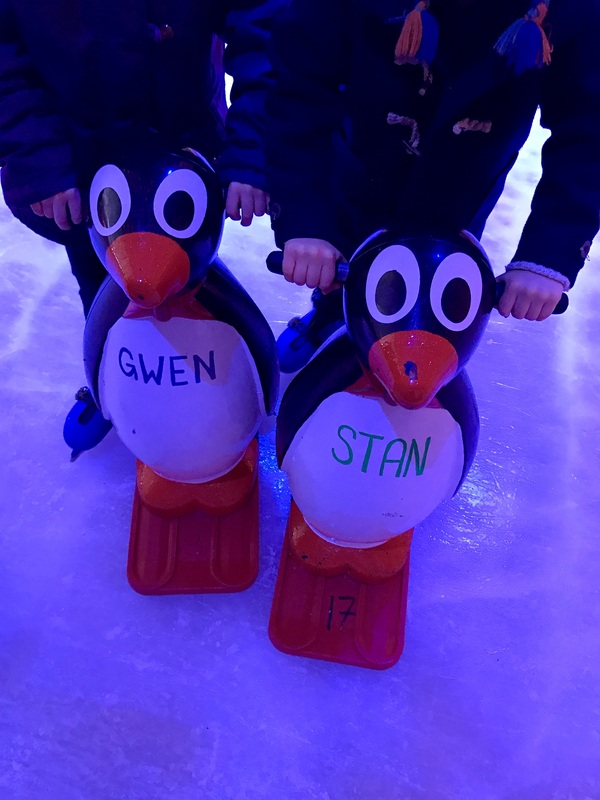 Gwen and Stan are the names ofvthe penguins. Having Winter Wonderland on our doorstep compliments christmas especially with the new roof over the rink. Just like Cardiff Mummy I have not been ice skating for many years so would love to have a go with my husband and boys, may turn into a bit of a skate off between my husband and I! The penguin were Gwen and Stan. Fingers crossed.